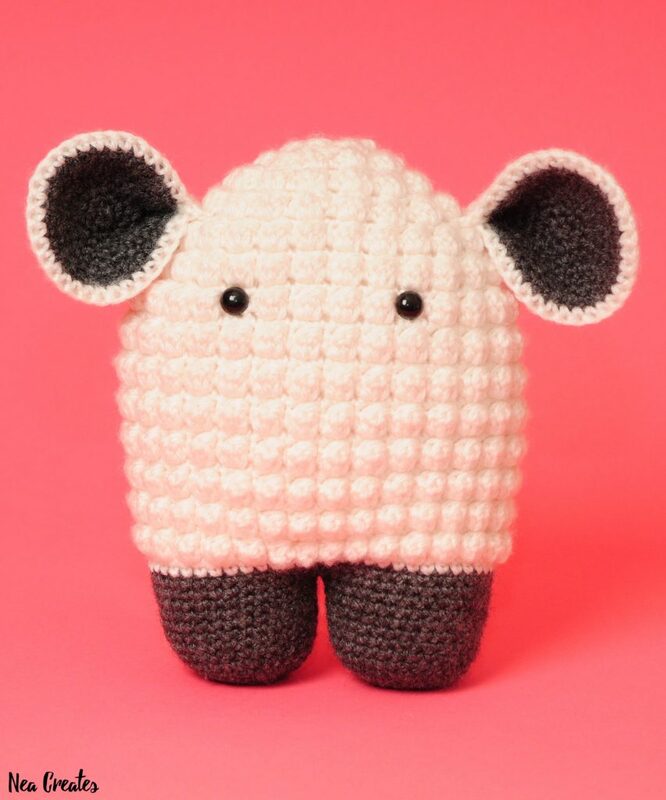 He’s all done, my first free amigurumi pattern, Hugo the Lamb! I actually designed him last summer (2016) but I think I’ve made around six different versions of him to get the pattern just right. I am very happy with how he finally turned out and would like to share the pattern with you today! You might notice that Hugo resembles my blog logo, which is not a coincidence. Being the first amigurumi that I’ve created completely on my own, from idea to finished product and pattern, he inspired me to start a blog in the first place. I’ve decided that Hugo the Lamb is an intermediate pattern, because of the joining of legs and use of bobble stitches. 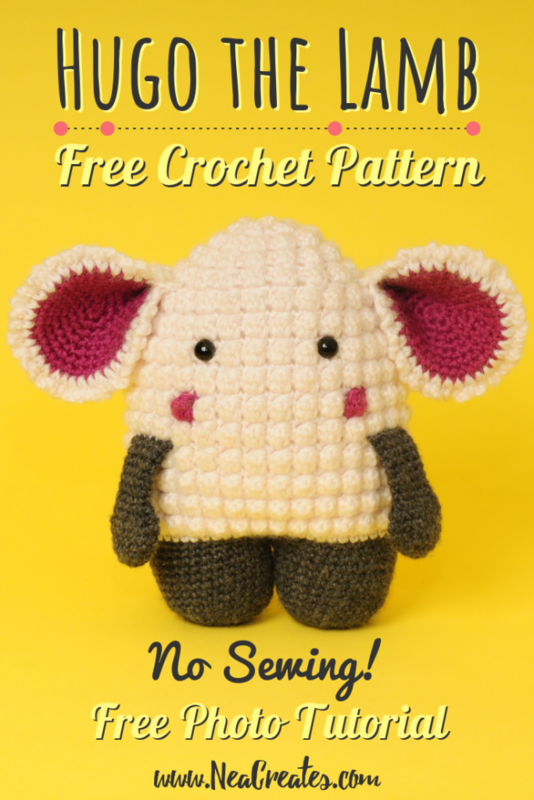 However, this pattern does not need you to sew on any pieces, arms and ears are crocheted on as you go along. This makes it kind of important to make the things in the right order, so ears and arms first. Good luck! 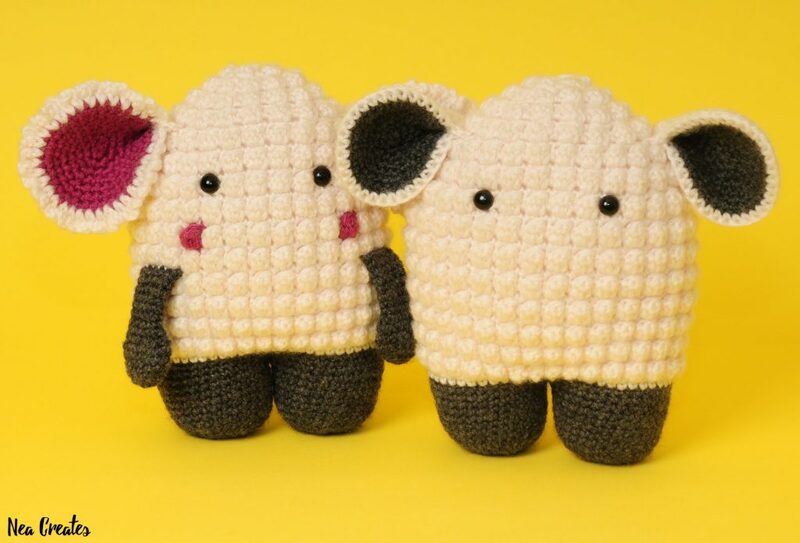 You can buy a cheap bundle of two beautifully formatted PDF versions of this pattern on Etsy. One version uses color, while the other is made in black and white to be more printer friendly. 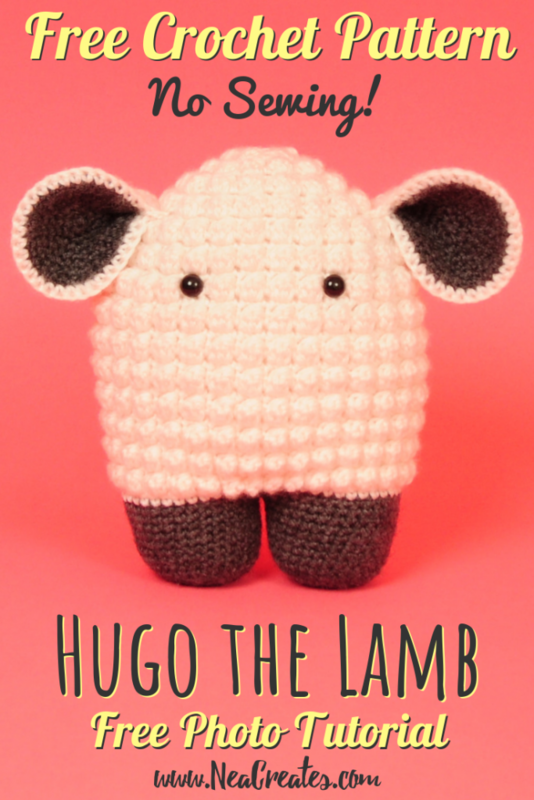 Here’s the link to the Hugo the Lamb Ravelry page, if you would like to start a project there. 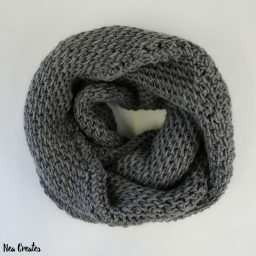 Disclaimer: This pattern is an original pattern by Nea Creates, it may not be redistributed in any way, shape or form. If you want to share the pattern you may link to this post, you may not repost the pattern on your site. Items completed from this pattern may be sold, provided that you give Nea Creates credit for the pattern and provide a link to this post or the Nea Creates homepage. Finished size: when finished, Hugo measures approximately 19cm tall, 13cm across the widest part of the body, 22cm (plain)/23 cm (fluffy) between the ears and 9cm thick. Notes: This pattern uses US crochet terms and SI units throughout. I use a smaller hook size than what the yarn calls for to get tighter stitches. Ears, arms, legs and the beginning of the body are worked in continuous rounds, the rest of the body is worked in closed rounds. N! Do not cut the yarn or tie off. N! After both legs are finished, line them up beside each other with their yarn tails facing you. N! From this point we will be working in closed rounds. 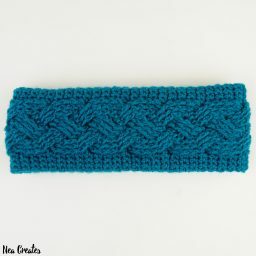 Because bobble stitches build on the wrong side, the rows with bobble stitches will be worked from the inside of the body instead of the outside. N! With arms: fold each arm with the yarn tail to one side to make 5 pairs of sts (P10). When attaching the arms the yarn tails should be facing each other. N! 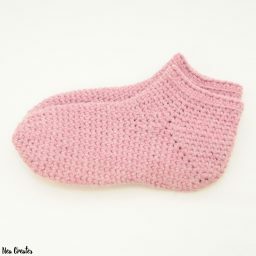 With rosy cheeks: cut two pieces of pink yarn, approximately 60cm long, to use for each cheek. For R15 crochet with the pink yarn around the white yarn to carry the white yarn over each cheek. N! With rosy cheeks: for R16 pull the white yarn in on the inside of the body before switching to the pink yarn. Do not crochet around the white yarn. Pull the pink yarn tail in on the inside of the body and on top of the white yarn when switching back so that the pink yarn is caught on the inside of the body by the first yo in white. N! With rosy cheeks: tie a knot with the yarn tails of each cheek. N! Keep stuffing and shaping the body. N! Do the final stuffing of the body. N! Make sure that you have stuffed the body properly, then cut the yarn and thread it on a yarn needle, weave the yarn tail through the front loops only of the remaining sts (8), pull to close (P18). Make a knot or two with the tail then bury it inside of the toy.